giveaway | I am Chubby Bunny! Hello Kitty Noir x Sephora x Chubby Bunny! On December 10th, Chubby Bunny was excited to participate in the Hello Kitty Noir launch party, hosted by Sephora! We’re always so happy to collaborate with our friends at both Sanrio and Sephora, and this time was no exception! This time, to celebrate the launch of the new Hello Kitty Noir beauty collection at Sephora, they hosted a swank, swingin’ 20’s style party at Maison 140 boutique hotel in Beverly Hills. This private event was open to Hello Kitty collectors and friends for an intimate gathering to view the Hello Kitty suite inside the hotel! Chubby Bunny was commissioned to make fun and fancy striped bows to show off Sephora’s signature pattern, as well as embody the Hello Kitty-shaped bow that we’ve become famous for creating! Take a look at the new design! Big thanks to Yume for taking photos that night, and also Hello Kitty Junkies for their great photos from the night, too! The bows were given to guests as they entered the hotel by these super cute retro cigarette girls! I was able to hop over to the event in some vintage wear! I really love this dress! Me looking like a doofus posing in the Hello Kitty suite. Check below for more fun photos from the event! Kerli + Chubby Bunny “BUBBLE BUNNY” Contest! The announcement you’ve all been waiting for! Now fans of both Chubby Bunny and Kerli will have a chance to show their creativity in this super fun contest! For some details on how the event came to be, you can check out the article in LAWeekly here! Show us your interpretation of “Bubble Bunny.” by making a creative piece and Enter to Win exclusive Chubby Bunny products and a DIY gift from Kerli! + Peep Kerli’s “Army of Love music video & Chubby Bunny’s sweet style! +Submit a well-lit photo of your piece bu the deadline specified! CLICK HERE TO ENTER & FULL CONTEST RULES! Take a look at our “Behind the Scenes” video of the photoshoot that produced this amazing photo. Take a look at Chubby Bunny’s new products at our official webshop! Good luck everyone! And don’t forget to have your friends vote for you, too! Chubby Bunny Spring 2011 Preview! I’ve been diligently spending all month promoting my artists and the Bunnies & Bows show, but have been leaving you all in the dark as to my new line of awesome products that I’ve been slaving away on for months! I hope you all like the new line! A lot of my inspiration comes from the old brew of pink, blue, and purple sparkly times that make up my image of white life should be like… I have a childlike love of stars which I’ve pulled into my T-shirt and dress designs, which are all custom rhinestone-d and printed by myself by hand. Pom Pom Cones from Space! If you’ve stuck around to look at all the photos, here’s a little reward for you! Chubby Bunny will be announcing a CREATIVE and AWESOME collaboration contest with the one and only KERLI! Stay tuned for contest details, which will be announced on May 7th, the same day as the big party! Chubby Bunny announcement: Hello Kitty x Sephora Collaborations and Events! I’m so pleased to finally announce a bunch of special projects I have been doing with Sanrio for the Sephora Hello Kitty Beauty collaboration! The release of this ultra cute line is being celebrated with special events around Los Angeles! This Saturday, March 5, 2011 in LA – you are invited to the ultimate Hello Kitty photo op: Hello Kitty herself will be visiting three Sephora stores in L.A. to greet fans and pose for pictures. Come say hello, and get your signature Hello Kitty makeover at the Beauty Studio. While you’re there, take home a small surprise gift— a different one will be available at each store, so stop by all three to collect the set. 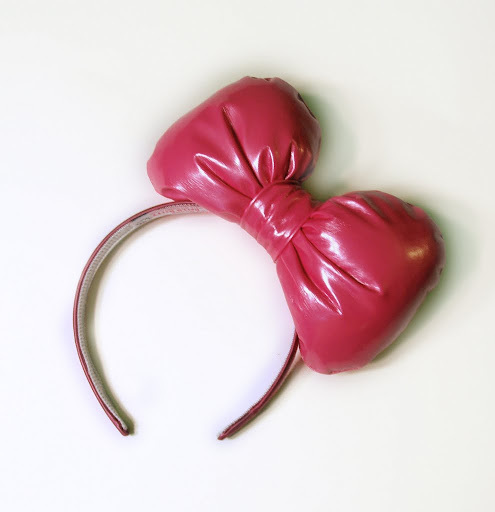 Chubby Bunny x Hello Kitty Collaboration bow, now on sale at iamchubbybunny.com! Chubby Bunny hand crafted Hello Kitty’s pink bow for the Sephora staff around the U.S. to wear to celebrate the release! Thousands were handmade to accommodate each store! This was the huge project I was never really able to talk about last year…! I’m very happy to finally see it to fruition! Take a peek at their cute headbands, and if you like them, make sure to stop by my store to purchase one of your very own! Additionally, I was honored to be asked to design and create the special Hello Kitty mascot costume for the Sephora events! Hello Kitty will be sporting a Chubby Bunny design inspired by the look and feel of Sephora! 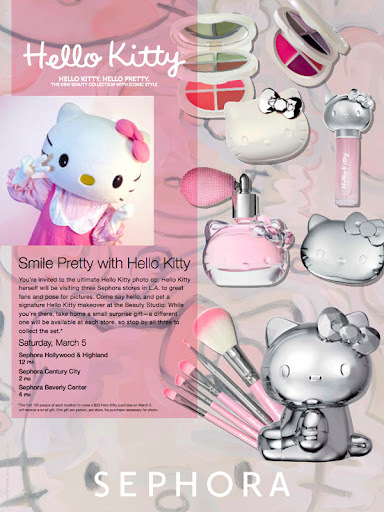 I hope you will be able to make it to one of the three Hello Kitty x Sephora events this Saturday, March 5, for a photo op with Hello Kitty in her newest outfit, and to see all the adorable Hello Kitty makeup and merchandise! Chubby Bunny Birthday Contest Winner! Congratulations to Jovi!, aka phantomBrows on Twitter on winning the Chubby Bunny Birthday Giveaway! Thanks to everyone who participated in this fun little contest! A Very Chubby Bunny Birthday Present For You! Today is my birthday! Hooray! Every May 6th, I celebrate the birth of my troublesome self into this world. I took a quick pic to commemorate this auspicious day, and also to show off a new creation of mine ❤ I made a simple red and black headband / rabbit ear wrap that wraps around my head and twists at the top. The black design (hard to see in these shots) was sprayed on using doilies for stencils on top of a sheer red fabric. I’m not a super strong believer in star signs, astrology, and all that, but what the hell. Once a year is okay, right? According to my birth date, my TREE OF MEANING is the POPLAR TREE, also called THE UNCERTAINTY. Ha! Story of my life. According to the internet, the Poplar Tree is decorative, but not very self-confident, only courageous if necessary, needs goodwill and pleasant surroundings, is very choosy, often lonely, has an artistic nature, is a good organizer, is reliable in any situation, and takes partnership very seriously. Vague, but true! Would you all say these generic traits match you all perfectly, as well? Ha! I also share the same birthday as my bros George Clooney, Orson Welles, Sigmund Freud, and Tony Blair! Details about the Chubby Bunny Giveaway! In honor of my birthday, I’d like to give away something to one of readers! Yup, instead of a present to me, here’s one to you! To enter, you must do all three of the below! Riddle me this and comment on this post with your answer: What kind of posts would you like to see more of? Subscribe to this blog by click on the “Subscribe” button on the lower right of this page! I’ll randomly pick a winner, and that lucky guy or gal will receive a Chubby Bunny x Hello Kitty collaboration headband bow in red, along with a handful of other cute goodies! You have until 12:00AM PST to enter so hurry, curry!